As is the case for many, my teens were such an awkward time and I had so many ups and downs, but I've definitely come out stronger and am super proud of how far I've come, but if I could go back and share these pieces of advice with myself, I definitely would. I spent so much of my teen years trying to impress friends and wanting to be friends with everyone and be liked by everyone, when in reality, I'm only still close with a handful of those people and the rest were only friends because we were forced to hang out at school everyday. I wish I'd spent less time worrying and more time enjoying the friendships I had. I'm sure for a lot of people this is the same, there was this phase where we all plucked our eyebrows to within an inch of their life - not a good look!! I remember spending so much of my teen years getting upset because of a boy, which in reality was probably after a 2 week relationship, but it was so important to me back then, yet we were so immature and didn't know what a relationship meant. If only I knew the true meaning of a relationship back then, I'm sure I wouldn't have spent as much time crying over boys! When I look back at some of my old photos my make up was something else! Glittery eyeliner was a favourite at one point, what was I thinking? I know I also used to block my eye shadow, why did I think that was a good idea?! I used to stress so much about the future, whether I'd get good enough GCSE's for sixth form or if friendships had broken down, it was the worst thing in the world as I thought I'd end up with no friends, when reality it's all worked out well and I'm very happy with where I've come since I was a teenager. PS. 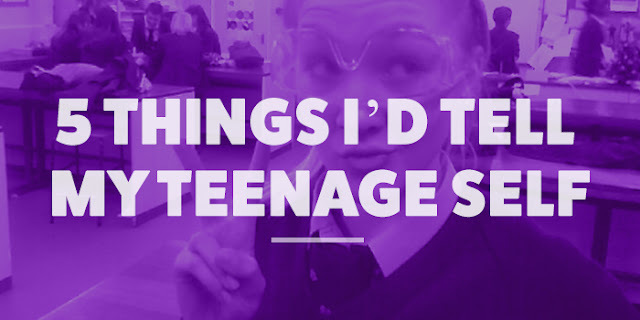 Can we take a moment to appreciate how cringe I am in the above photo - apparently I thought wearing science goggles upside down was cool!